His orchestral, chamber, and vocal compositions have been commissioned by the Los Angeles Philharmonic, Kronos Quartet, BAM Next Wave Festival, Barbican Centre, Edinburgh International Festival, Sydney Festival, eighth blackbird, Sō Percussion, New York City Ballet, and many others. 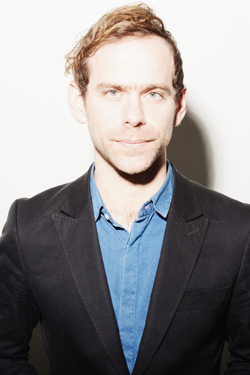 Bridging musical languages and communities comes naturally to Dessner, born 1976 in Cincinnati, Ohio. After early training on the flute, he switched to classical guitar in his teens. While in high school he started a band with his twin brother Aaron, also a guitarist. He earned his bachelor’s and master’s degrees from Yale University. In the late 90's, he formed the adventurous instrumental quartet Clogs, and in 2001, co-founded the critically acclaimed, Grammy-nominated indie rock band The National. Aheym, commissioned by Kronos Quartet, was a breakthrough work. Since its premiere in 2009, the ensemble has played the piece hundreds of times, and recorded it on a 2013 disc devoted to Dessner’s music on the Anti- label. St. Carolyn by the Sea followed in 2014 on Deutsche Grammophon, featuring the lyrical title work and two other Dessner compositions performed by the Copenhagen Phil under Andre de Ridder. May 2015 marks the release on Brassland of Music for Wood and Strings, an album-length work performed by Sō Percussion. MusicNow, the eclectic Cincinnati-based music festival Dessner founded in 2006, recently celebrated its 10-year anniversary. For 2015, he was tapped to curate ‘Mountain and Waves,’ a celebration of his music at the Barbican in London, and a weekend festival at Cork Opera House, Ireland. Other notable projects include Quilting, a 17-minute score co-commissioned with the BBC Symphony Orchestra, which premiered in May 2015 by the Los Angeles Philharmonic conducted by Gustavo Dudamel, and The Most Incredible Thing, a ballet created by Dessner, Justin Peck and Marcel Dzama, premiered in February 2016 by the New York City Ballet. Dessner now resides in Paris and has been increasingly active composing for major European ensembles and soloists. In 2016, he premiered a new piece entitled Wires commissioned for the Ensemble Intercontemporain and Matthias Pintscher, as well as recent solo works for violinists Pekka Kuusisto and Jennifer Koh, and a concerto for renowned pianists Katia and Marielle Labeque which toured across Europe in 2018-2019. A Baryshnikov scholarship has facilitated a commission for YMusic for October 2019. In LA in March 2019, Roomful of Teeth and Brad Wells will present a new piece by Dessner integrating the work of photographer Robert Mapplethorpe. Director is Daniel Fish with libretto by Dessner and Korde A. Tuttle. Future projects include a major orchestral commission, a stage work with Enda Walsh and a concerto for Pekka Kusisto.